But what do Poles have to do with Iran, India and Africa – when and how did they find themselves there? POLcast talks about this with a person who went through this experience – Irene Tomaszewski from Ottawa, whom POLcast listeners know from our previous conversation about Cosmopolitan Review (CR) online magazine in Episode 6. Irene Tomaszewski is a writer and editor of CR. She is the co-author, with Tecia Werbowski, of “Codename Żegota: The Most Dangerous Conspiracy in Occupied Europe,” published by Praeger in 2010, and translator /editor of “Inside a Gestapo Prison: The Letters of Krystyna Wituska” published by Wayne State University Press in 2005. 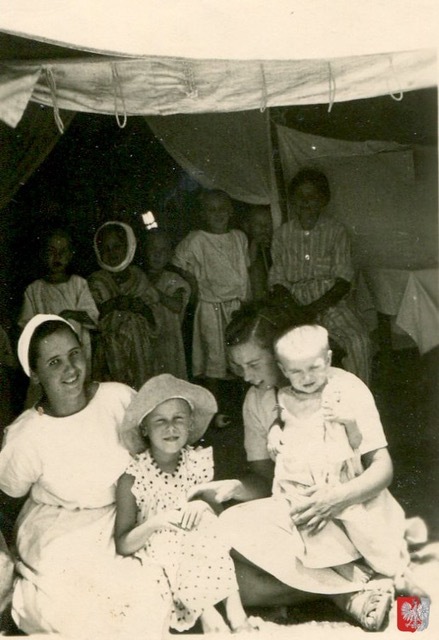 Tehran tent hospital 1942. First ever photo of ugly little me, age 2. Not walking, not talking. My sister Halina. Wanda is in the hospital with tuberculosis. In our next episode 47, we will continue this fascinating story to learn about Irene Tomaszewski’s childhood and the lives of thousands of other Polish children in Africa. February 1940: Exile, Odyssey, Redemption – this roundup of CR pieces tells the deportation saga: from the endless journeys and the camps and then, for some, escape – and the most extraordinary odyssey of WWII.